In April and May 2018 ZWV hosted two electronics recycling events in order to relieve the backlog of electronics accumulating on island. These items are not allowed for disposal at the transfer station. All told we collect 7.5 tons of electronics at these two events! This depends on the electronics item. After the event, everything is taken to SBK Recycle in Tacoma. There the computers are stripped of their components. The hard drives are crushed, parts are removed sent to the appropriate processor. For example, mother boards are sent to Japan for processing. There are only 2 plants in the world that can process these components for rare metals safely. One is in Japan and one is in Belgium. An interesting fact is that it is less expensive and environmentally more friendly to recycle these rare metals than it is to mine them. Printers are mostly plastic. They get sent to Auburn to a plastics recycler. Major metal components get sent to metal recycling. LCD screens get sent to California. UPDATE: Due to the overwhelming need for recycling electronics ZWV will be holding another event on Saturday, April 20, 2019 from 10am to 12pm at the High School, east lot (use the swimming pool entrance). We’ll try to have two trucks so that we can process and load more quickly. The same items will be accepted for recycling. ZWV is hosting its third Electronics Recycling Event on April 20, 2019 from 10am to 12pm at the east lot of the High School. Enter by the swimming pool. 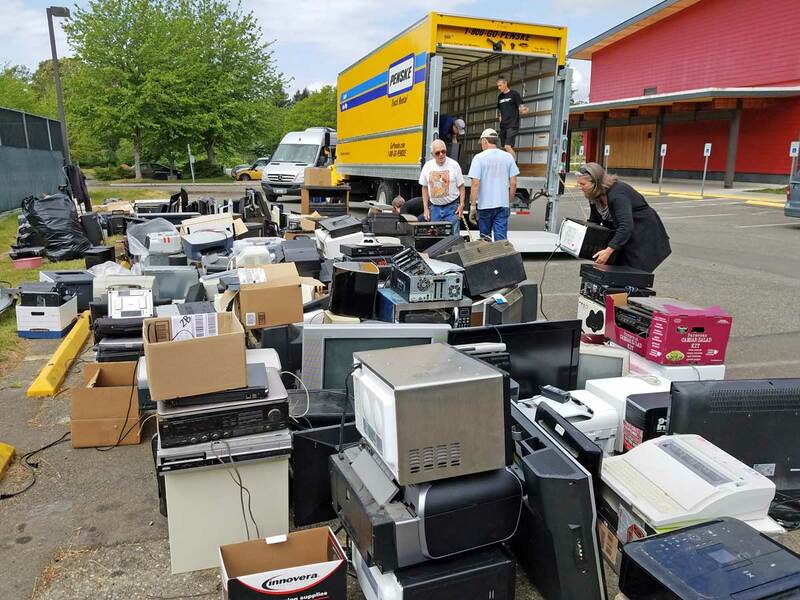 We will be accepting computers, laptops, monitors, ink cartridges, printers, fax machines, keyboards & mice, servers, routers, televisions – except giant rear-screen units, dvd players, vcrs, audio components, radios, cellphones, telephones, cameras, electronic games and small electronics. No appliances accepted except microwaves. CRT TVs have a $10 fee to cover high recycle costs.